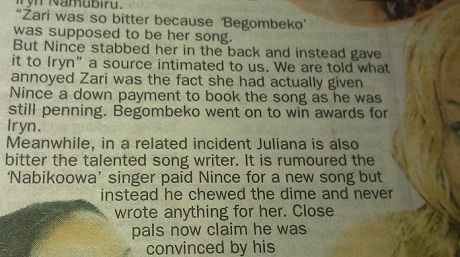 In yesterday's Red Pepper, it was reported that there was bad blood between the 2011 Song Writer of the Year Nince Henry, Juliana and Zari. Nince Henry was to write 'Begombeko' for Zari but the song writer instead sold it to Iryn. What Zari is saying is exactly what is happening. There was no mention of her and Iryn having issues and the direction which the article took did not in any way warrant good publicity for the Song Writer. This instead confirmed the bad blood between Nince Henry and Zari most probably for having sold the 'Begombeko' track to Iryn and yet Zari had given an advance payment to the song as Nince was still penning. Meanwhile, Dembe FM's Straka called Nince Henry to get his position on the matter, he simply blasted her. Nince Henry is a song writer who turned into a musician was behind tracks like 'Omukwano Gunyuma' by Samalie Matovu and Ekikunyumira by Julie Mutesasira.